The area around Cannes boasts glamorous resort towns, spectacular scenery, lovely seaside villages, and quaint hilltop towns. Those who appreciate nature will enjoy the Estérel Mountains and the Iles de Lérins island group. For those seeking a classic French Riviera experience, Saint-Tropez and Antibes delight with sandy beaches and a lively resort ambience, especially during summertime. Beyond the most visited attractions are alluring off-the-beaten-path sights. The lesser-known beach resorts of Fréjus, Saint-Raphaël, Théoule-sur-Mer, and Mandelieu-La-Napoule offer a slow-paced and relaxing vacation experience. Only 18 kilometers from Cannes, the town of Grasse has a mild climate year-round and is famous for its perfumes. Other gems are the little village of Vallauris with its wonderful Picasso Museum inside the former chapel of a 12th-century monastic abbey and the ancient "village perché" of Biot, a charming medieval hilltop village. The tiny royal principality of Monaco offers an enormous amount of glamour considering it's only two square kilometers in size. Standing on a rocky promontory known as "Le Rocher" ("The Rock") high above the sea, Monaco boasts a sublime Mediterranean environment of palm trees, lush vegetation, and flowers. Top attractions on "The Rock" are the Palais du Prince, home to the Monaco royal family, and Monaco-Ville, the historic area of Monaco that features atmospheric, narrow streets. At the Monaco harbor, the scene of luxury yachts lives up to the town's reputation for extravagant wealth. The rich and famous are also drawn to Monaco's designer boutiques, upscale restaurants, and five-star hotels. Despite the aura of exclusivity, Monaco appeals to tourists who simply appreciate the beauty and culture found here. For entertainment, the Opéra de Monte-Carlo offers a superb schedule of classic operas, concerts, and ballet performances. The Musée Oceanographique awes visitors with its spectacular seaside location, outstanding aquariums, and exhibits on marine science. Monaco's natural splendor is also found in the abundance of gorgeous gardens with mesmerizing views. To discover these amazing sights, try an organized tour from Cannes, such as the Monaco and Eze Small-Group Day Trip, which includes a scenic drive along the Lower Corniche coastline. Before Saint-Tropez became a legendary beach resort, it was just a little fishing village with the slow pace of a small town in Provence. Impressionist painters discovered the alluring quality of Saint-Tropez in the 19th century. But it was Brigitte Bardot's appearance in Et Dieu Créa la Femme (filmed in Saint-Tropez) in 1955 that made the village world famous. Today designer boutiques, fancy restaurants, and private beach clubs are de rigueur. However, Saint-Tropez has several excellent public beaches, and the historic village has retained its character, seen in the quaint cobblestone streets and squares shaded by leafy plane trees. Humble fishing boats, as well as luxury yachts are docked in the Old Port (Vieux Port), which is animated by outdoor cafés and colorful street art. Locals and tourists alike shop at the traditional Provençal market, held daily at the Place aux Herbes. Tourists will also want to see the Impressionist and modern art collection at the Musée de l'Annonciade and visit the 17th-century citadel that now houses the Museum of Maritime History. Saint-Tropez is an 85-kilometer drive from Cannes, but the most enjoyable way to arrive here from Cannes is by boat. The Ferry to Saint-Tropez from Cannes is a round-trip ferry boat service (about a 75-minute journey each way) that allows tourists to explore Saint-Tropez on their own for a full day. This picture-perfect medieval "perched" village boasts exceptional views, thanks to its dramatic location on a hilltop more than 400 meters above the Mediterranean Sea. On a clear day, the town's vantage point offers a sweeping view of the French Riviera coastline from Nice to Monaco. Within the once-fortified village, winding cobblestone streets delight visitors. The village brims with quaint alleyways, bougainvillea-trimmed courtyards, inviting boutiques, and small galleries that display paintings by local artists. Nature lovers should visit the Jardin Exotique, a lush garden with a breathtaking panorama of the coastline, while gourmands will want to dine at the Michelin-starred restaurant at La Chevre d'Or hotel. Other top attractions include the Fragonard Perfume Museum and the scenic hiking trail that traverses a steep path all the way down to the beach. Since Eze is most easily accessible by car, many travelers will have the best experience by taking an organized tour. A great choice is the Monaco and Eze Small-Group Day Trip, which picks tourists up at their hotel in Cannes and offers a relaxing guided tour by minivan. The dramatic Estérel Mountains rise immediately behind the Côte d'Azur coastline between Saint-Raphaël and Cannes, bordered by two valleys. Formed of ancient volcanic rock, the Estérel Mountains are characterized by the distinctive reddish and earthy hues of the landscape. Spectacular gorges and steep cliffs plunge directly into the sea. The rugged hillsides and jagged peaks are overgrown with typical Mediterranean shrubbery and shaded by acacia, eucalyptus, and palm trees. The highest peak of the Estérel Mountains is Mont Vinaigre, which reaches 618 meters. From Fréjus to Mont Vinaigre, the drive on the N7 includes 11 kilometers of a narrow forest road. At the summit of Mont Vinaigre, a breathtaking panoramic view awaits. The Corniche de l'Estérel is another picturesque road (N98) that winds its way along the rocky coast between Saint-Raphaël and Cannes. The drive goes through the resort of Boulouris and passes by the impressive Cap du Dramont lighthouse. An excellent place to stop is at the coastal village of Agay at the foot of the Rocheuse du Rastel (hillside) in a protected bay. This sunny village has a wonderful beach, and its calm seas are ideal for watersports such as sailing, kayaking, and jet skiing. Every Thursday morning, a traditional Provençal market is held at Place Giannetti, the town square near the waterfront. Another gorgeous sight in the Estérel Mountains is the Pic de l'Ours, which can be approached from the village of Agay. The mostly single-lane road leads inland (for about 30 minutes) and encircles the Pic de l'Ours mountain peak, which reaches 496 meters. At the summit, near the Col Notre-Dame, there is a magnificent sweeping view of the rocky coastline. The Iles de Lérins are a short ferry ride (available several times a day) from Cannes, between the Golfe de la Napoule and the Golfe Juan. This group of islands was a center of ecclesiastical teachings and monastic life in the 5th and 6th centuries. In 660, the monastery assumed the Rule of Saint-Benedict. Later, the islands were attacked by the Saracens and then by pirates from Genoa. The Ile Sainte-Marguerite is the largest island of the Lérins and is covered with lush eucalyptus trees and pine woods. The island has a 17th-century fort that was once a prison. Ile Saint-Honorat boasts monastery buildings associated with Saint Honoratus, the Bishop of Arles (who died in 429). In the southern part of Saint-Honorat Island, by the sea, stands the impressive Château Saint-Honorat, built in the 11th century as a refuge against pirates. Its immense walls and crenelated ramparts were designed for defense. There are exquisite cloisters on the ground and first floors as well as extensive sea views from most rooms. Seven chapels were once scattered about the island; the only two remaining are the early Christian Chapelle Saint-Sauveur and the early medieval Chapelle de la Trinité. A delightful vacation destination, Antibes is a busy resort town with many cultural and natural attractions. With its views of the Mediterranean Sea and charming cobblestone streets, the Old Town is a pleasant place to wander and discover the boutiques, cafés, and restaurants. Antibes also encompasses the coastline of Cap d'Antibes and Juan les Pins, two areas that have several public beaches with beautiful sandy shores surrounded by shady pine trees. Another top tourist attraction is the Picasso Museum, which displays a renowned collection of Picasso's art in the medieval Château Grimaldi, a landmark in itself. For those who enjoy hiking, the five-kilometer seafront walk along the Chemin des Douaniers offers a delightful way to experience the stunning coastal scenery. Those who appreciate history can visit the Archaeology Museum in the Bastion Saint-André to take in the captivating history and see fascinating ancient artifacts. Music lovers will want to attend the legendary Jazz à Juan festival held annually in July at a spectacular outdoor theater by the sea. This jazz festival draws exceptional talent including world-famous musicians. An attractive port town near Cannes, Fréjus was built on the site of a Roman city that Julius Caesar founded in 49 BC. 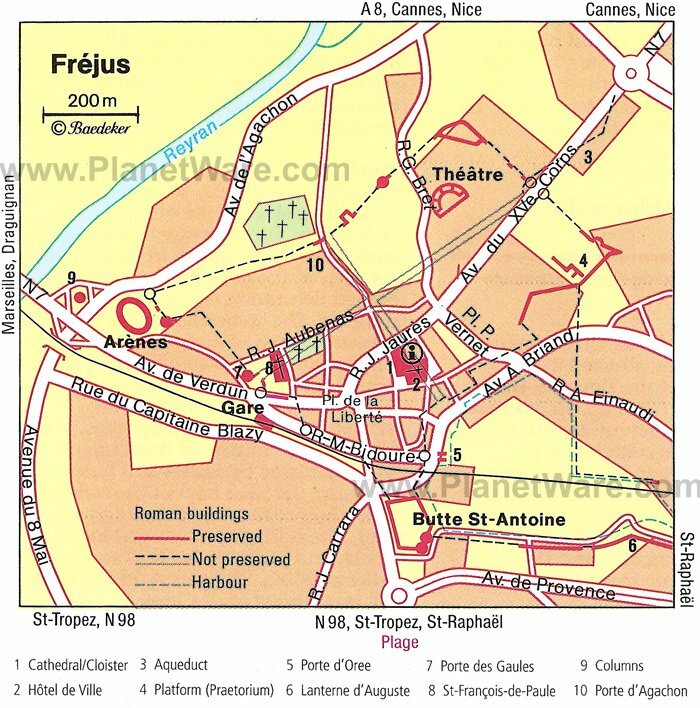 In fact, the remarkable Cathedral of Fréjus has a pre-Romanesque 5th-century baptistery that incorporates ancient Roman columns and is one of the earliest Christian churches in France. The cathedral's serene cloister features delicate pillars and exceptional 14th- to 15th-century ceiling paintings of the Apocalypse. For those interested in Classical-era history, the Archaeology Museum displays pieces found at archaeological digs in Fréjus. The town's most noteworthy archaeological sites include the 1st- to 2nd-century Arènes (Roman Amphitheater) on the rue Henri Vadon, which originally accommodated 10,000 spectators, and the 1st-century Théâtre Romain (Roman Theater) now an outdoor venue for Les Nuits Auréliennes, a summertime festival of amateur theater. For those seeking the pleasure of sunshine and seaside, Fréjus offers a balmy climate, a bustling marina, and sandy beaches. This sunny seaside resort extends over 36 kilometers of pristine coastline between the Estérel Mountains and the Mediterranean Sea, with six public beaches and many opportunities for sailing. During the Victorian era, Saint-Raphaël was an upscale holiday destination with grand Belle Epoque hotels and villas. Unfortunately, much of the town's stately architecture was destroyed in the blitz of the Second World War. However, there's still a charming old fishing port, appealing waterfront neighborhoods, and a vibrant commercial center. While on vacation in Saint-Raphaël, tourists will find plenty of things to do, such as wandering the shaded streets of the Old Town, shopping at the Provençal markets (Place Victor Hugo, Place de la République, and Place Giannetti), strolling along the scenic Santa Lucia port, and sunbathing at the beach or in a protected cove. Other must-see attractions include the 7th-century Romanesque church, the Roman Byzantine-style Basilique Notre-Dame de la Victoire, and the Archaeological Museum housed in a historic monument that displays Roman-era artifacts and features splendid panoramic views from the watchtower. Grasse is a quintessential Provençal hilltop town with superb views of the Provence countryside - the fields of orange blossoms, roses, jasmine, lavender, and violets that provide the essential oils to make exquisite fragrances. In fact, Grasse is world-renowned for its perfumes, introduced in the 16th century by Catherine de Medici. The Perfume Museum (2 Boulevard du Jeu de Ballon) educates visitors about the history of perfumes, soaps, and cosmetics. 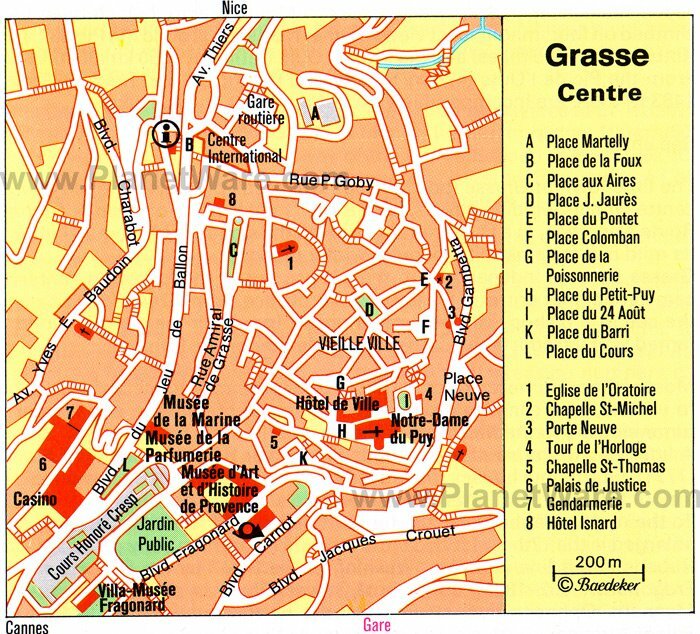 In addition, many perfume factories in Grasse, such as Fragonard, Molinard, and Galimard, offer guided tours and boutiques. France's Ministry of Culture has labeled Grasse a Ville d'Art et d'Histoire (City of Art and History) because of its unique cultural heritage. The charming historic center of Grasse can only be explored by foot because of the narrow thoroughfares. At the heart of the old town, the 13th-century Cathédrale Notre-Dame-du-Puy de Grasse has a simple facade inspired by the architecture of the Liguria region (near Genoa in Italy) and is filled with exceptional works of religious art, including pieces by the School of Louis Brea and Pierre-Paul Rubens. Another must-see attraction is the Villa-Musée Jean-Honoré Fragonard, a stately 17th-century house where the celebrated Rococo painter Jean-Honoré Fragonard lived for a while. Fragonard painted entire walls of the staircase and salon with lavish paintings. Above the Golfe-Juan, about five kilometers from Cannes, and surrounded by fragrant orange groves, this little town once belonged to the monks of the Lérins Islands. The rich religious heritage is seen in the town's many historic chapels and churches. The medieval Romanesque chapel of the Château de Vallauris (formerly the priory of the Abbey of Lérins) now houses the National Picasso Museum. In 1952, Pablo Picasso painted the vaulting of the chapel with his famous La Guerre et La Paix (War and Peace), two immense works of art covering more than 100 square meters. Another main attraction in Vallauris is the traditional decorative pottery. Vallauris' history of pottery making dates back to the Gallo-Roman and early Christian era. Today, many talented potters work in Vallauris. Workshops are often open for visits, arranged through the Tourist Office, and the Vallauris Institute of Arts offers pottery classes. The Ceramics Museum in the Château de Vallauris (the same building where the Picasso Museum is located), displays ceramics from different historical periods. One of the most beautiful villages on the Côte d Azur, the resort of Théoule-sur-Mer lies between the Estérel Mountains and the Mediterranean Sea. The village enjoys a wonderful location on the western part of the Golfe de la Napoule, with its picturesque shoreline. There are seven public beaches in Théoule-sur-Mer; many are fine sandy beaches and some of the beaches have more rugged terrain. In typical French Riviera style, there are private beaches with restaurants along the waterfront. Guests enjoy alfresco dining with splendid seaside views. Théoule-sur-Mer offers many leisure activities including tennis, golfing, horseback riding, sailing, and snorkeling. A perfect destination for a summer holiday, Theoule-sur-Mer is a wonderful place to relax and enjoy the slow pace of Provence by the sea. The seaside community of Mandelieu-La Napoule enjoys an idyllic setting, at the foot of the Massif du Tanneron (five kilometers west of Cannes) with the verdant Estérel Mountains as a backdrop. The town includes the quaint, old fishing village of La Napoule and the more modern beach resort of Mandelieu. Less crowded than Cannes, this area still exudes the vacation spirit of the French Riviera. The port area of La Napoule brims with upscale restaurants and casual bistros. Sun worshippers flock to the seven pristine sandy beaches found along the three-kilometer coastline of Mandelieu-La Napoule. Water quality is posted daily to ensure the safety of bathers and swimmers. Other things to do include nature walks by the seaside, hiking in the forest or by the coast, and golfing at one of the two 18-hole golf courses. During the tourist season, ferries travel regularly from Mandelieu-La Napoule to the Lérins Islands, Monaco, and Saint-Tropez. This quaint medieval hilltop village enchants visitors with its narrow cobblestone streets, quiet alleyways, and pleasant little squares. Built on the slopes of a steep hill (a typical "village perché"), Biot has many charming stepped pathways that lead up to viewpoints and reward visitors with lovely panoramas. Biot has an interesting history and played an important role in the Crusades during the 12th century. The Eglise Sainte Marie Madeleine was built on the ruins of a 12th-century Romanesque church and was largely rebuilt in the 15th century. Inside, there is a beautiful altarpiece, the Madonna with Rosary by Louis Bréa in the 16th century. The village is well known for its arts and crafts, including ceramics, glass blowing, weaving, and silk-screen printing. Biot also has an excellent museum, the Musée National Fernand Léger on the Chemin Val-de-Pome. The museum displays a comprehensive collection of Léger's works. Surrounded by ancient ramparts, Mougins (about 10 kilometers from Cannes) overlooks the rolling hills of the Valmasque Forest, with panoramas that stretch all the way to Grasse, the Bay of Cannes, and the Lérins Islands. This medieval perched village is unique because of its culture and cuisine. The artists Jean Cocteau, Joseph Fernand Henri Léger, and Pablo Picasso were drawn to the village's beauty and enchanting ambience. This artistic heritage lives on in a plethora of art galleries and studios. A must-see stop for art lovers is the Musée d'Art Classique de Mougins, which displays a broad collection, from ancient to contemporary art. Highlights are the Classical-era Roman statues and the paintings by famous modern artists, such as Marc Chagall, Paul Cézanne, Raoul Dufy, Pablo Picasso, and Henri Matisse. Mougins also has dozens of excellent restaurants and has been associated with exceptional gastronomy since 1912, when local chef Célestin Véran won the Équipages de la Flotte, a prestigious cooking contest.